Head of Iran’s railway resigned in a televised interview after a train crash that killed 49 people in Semnan province on Friday, offering an apology to the nation for the deadly incident. Speaking to IRIB news on Saturday night, Managing Director of the Islamic Republic of Iran Railways Mohsen Pourseyyed Aqaei said the Minister of Road and Urban Development Abbas Akhoundi has accepted his resignation. Earlier, Iran’s First Vice-President Eshaq Jahangiri had noted that Iranian executives in Rouhani’s administration are ready to resign after major events, even if they are not guilty. In the meantime, Iranian lawmakers are working on a plan to impeach Akhoundi for what they call his weak performance that led to the terrible train crash, Tasnim reported. In reaction to the possible impeachment, Jahangiri warned against politicized and partisan reactions to the deaths of Iranian people. How Did Passenger Trains Collide in Spite of Advanced Automatic Systems? According to a report by Tasnim, as translated by IFP, Jahangiri noted that the Islamic Republic’s railway system has been equipped with latest safety systems in recent years. While train is commonly known as the safest means of transportation thanks to Iran’s fully-automatic systems, it should be investigated why the advanced control systems have failed to prevent such a tragic disaster, he added. 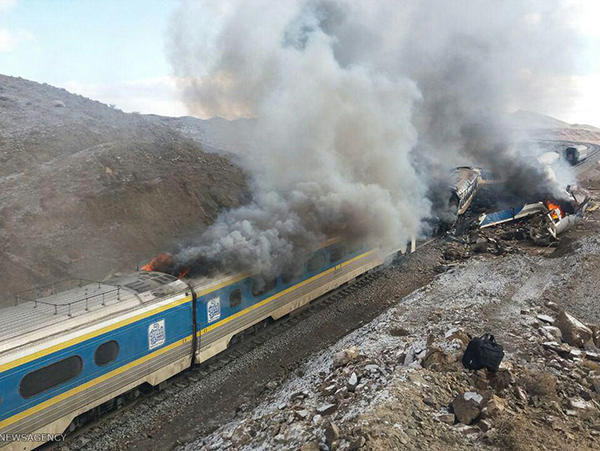 The incident’s death toll has risen to 49, while dozens of others were wounded in the crash, which occurred at around 8 a.m. Friday in a mountainous area near Haft-Khan station, on the railroad linking the cities of Semnan and Damghan. A passenger train travelling between capital Tehran and the northeastern holy city of Mashhad was stopping near the station when another train hit it from behind, setting a number of cars ablaze.